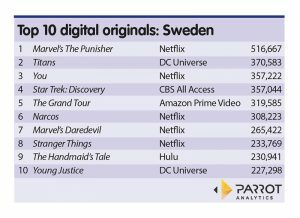 Two titles originally from DC Universe, the streaming service launched by DC Entertainment and Warner Bros Digital Networks last year, appear in Parrot Analytics list of the 10 most in-demand digital originals in Sweden for the week ending January 27. 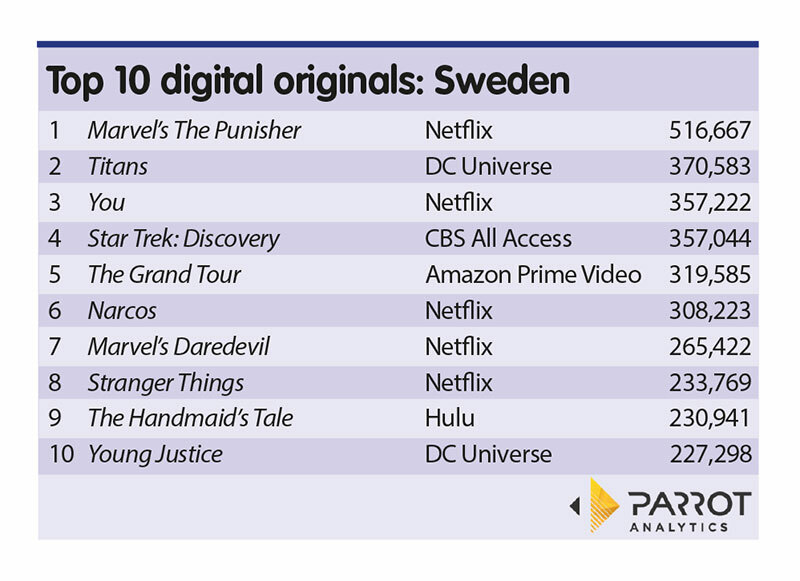 DC Universe’s Titans came second in the Swedish list, with an average 370,583 demand expressions, while Young Justice was in 10th place with an average of 227,298. Titans is however streamed by Netflix outside the US, with the latest season of the show debuting on the streaming service on January 1. The top 10 list was topped by Netflix’s Marvel’s The Punisher with an average of 516,667 demand expressions. Netflix took five of the 10 places on the list with its own originals, while CBS All Access’ Star Trek: Discovery, which is distributed by Netflix internationally, took the number four slot, and Titans took number two. The other non-Netflix titles on the list were Amazon Prime Video’s The Grand Tour at number five and Hulu’s The Handmaid’s Tale at number nine.